An obligate parasite of gymnosperms, mainly black spruce but also white pine and other conifers. Newfoundland and Quebec west to MN and Saskatchewan, south to northern NJ, PA, and MI. Stem to 1 cm or a little more, simple or with a few opposite branches; green brown. Leaves scale-like, tiny, roundish. Plants dioecious. Fruit a berry on a short, recurved pedicel. 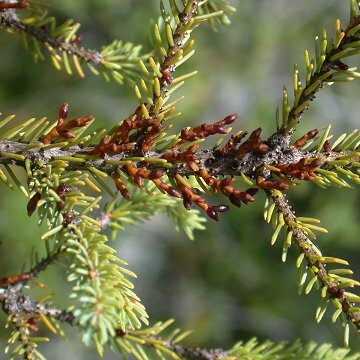 This tiny plant is parasitic, primarily on black spruce and less often on white spruce or occasionally on other conifers. It does not produce chlorophyll and obtains nutrition via a specialized root called a haustorium, which penetrates the vascular system of the host. The fruits are forcefully released when mature and are sticky, allowing them to adhere to nearby trees or to animals.